Non-stop 420 Class action around the world so far in 2019, with numerous events, training programmes and lots of sailors simply having fun sailing. Take a read of the news so far and catch up on what lies ahead for the 420 Class in the coming months - from showpiece events to national series, regional events to club racing, development initiatives to 420 Championships. Our newsletter is just a snapshot of 420 Class activity around the world - visit 420sailing.org for a full update. Notices of Race are published and online entry is open for the 2019 420 Worlds, 3-11 July in Portugal and the 2019 420 Junior Europeans, 23-20 July in Spain. Take a look at the Championship websites for all you need to know about entering, nation quotas, charter boats, accommodation and much more. The 420 Worlds offers separate racing fleets for open (men/mixed) and women, as well as a fleet for U17 (open and women). The 420 Junior Europeans is combined with the 470 Class, and offers separate U19 and U17 racing fleets for open (men/mixed) and women teams. Guaranteed to deliver spectacular racing alongside the world's best, friends made from around the world, shoreside camaraderie, fun socials and plenty of special memories. Come and join us. Although we are only 5 weeks into 2019, our Events Calendar already features over 170 events from more than 30 nations, reflecting the continuing growth and worldwide appeal of the 420 Class. Take a look and make sure we have your event covered. South Africa crowned its Youth National Champions at the close of 2018, with Ross MacKinnon/Alex Falcon leaving no opening for their rivals, claiming an 11 race win scorecard. Messing about on boats was the order of play at the Port Owen River Race, as 420s mixed it up in a handicap fleet last week. Don't miss the 420 Class Development Programme heading to South Africa later this year for a Sailors and Coaches Clinic. India's Tamil Nadu Sailing Association hosted the Indian Junior National Championship at the start of 2019, with Navyn Prabhakar/Neelanand R taking top prize. It was then straight onto the India International Regatta with the partnership again taking out the 420 Class win. M Uzair Amin Bin Yusof/Naquib Eiman Bin Sharin come out on top of a talented 24-boat 420 fleet at the Malaysian National Open Championship. Korean 420 teams headed to Auckland for the Oceanbridge NZL Sailing Regatta, walking away with 3rd and 4th on the leaderboard. 420 Coaches and Sailors Clinic are planned in Malaysia, Singapore and Taiwan later this year. The Callahan brothers, Justin and Michael, racked up their first USA 420 National Championship win, as a warm-up ahead of the 420 North American Championship. All change saw a new pairing control the 34 boat fleet for the continental champs, with Thomas Hall/Mariner Fagan locking themselves into front of fleet racing from day 1. 21 teams took to the race track for the Brazilian 420 National Championship, with Leonardo Lombardi/Pietro Geronimi (BRA) seizing gold on a 1 point advantage. Star 420 sailors Carmen Cowles/Emma Cowles launched their year shortlisted for the US SAILING Rolex Yachtswoman of the Year Award. Watch this space for the winners to be announced later this month. 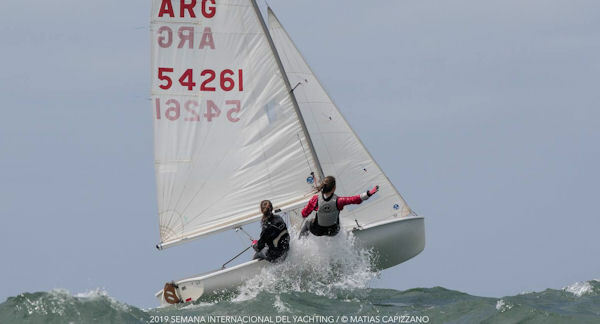 420 racing is currently underway at the 54th Semana Internacional de Yachting in Argentina, and the Brazil Youth Cup is about to kick off. Last weekend, 420 Coaches Neil Marsden/Jonny McGovern showed Britain's top 420 talent how it is done, winning the Tiger Trophy in a mixed handicap fleet. Held in tribute to John Merricks, the event celebrated its 25th anniversary. The 420 Class has joined forces with the European Sailing Federation (EUROSAF) to launch the new EUROSAF 420 Race Circuit. Embracing six events and designed to promote 420 sailing in Europe, the circuit kicked off at Imperia Winter Regatta in Italy. As well as titles and medals, winning teams will be awarded free entry to the 420 Junior Europeans in Spain. DEADLINE ALERT - make sure your Member National Authority submits its entry request to World Sailing for the Youth Sailing World Championship in Poland by the deadline of 15 February 2019. How about combining your passion for skiing and sailing? Then head to Ski Voile in the South of France, where this year Amelie Flandorffer/Iona Wyper took victory in the thirteen 420s from their mastery of snow and water. Carlotta Scodnik/Camilla Scodnik (ITA) took the win at the first of two weekends of racing for the International Genova Winter Contest hosted by Yacht Club Italiano. Over in Portugal, forty-two 420 teams faced off at Event #2 of Portugal's 420 National Series, with Luis Niza/Paulo Baptista wrapping up victory with a race to spare. Want to improve your 420 knowlege, then why not sign up for the first 420 Class Coaches and Sailors Clinic of 2019 in Ukraine? An outstanding run of performance sees Seb Menzies/Blake McGlashan (NZL) as the headline team to beat in Oceania. Glory days at the 2018 420 Worlds has continued with a virtually unbeatean run. The pair opened 2019 with a win at the Australian 420 Nationals, followed up with victory at the Australian Youth Championships, another win at the Auckland Championships, and most recently victory at Oceanbridge NZL Sailing Regatta. Sophie Jackson/Chloe Harper won the women's Australian 420 Nationals, and Lily Richardson/Matilda Richardson took out the Australian Youth Champs women 420 title. Date for your diary, as a420 Class Coaches and Sailors Clinic will be heading to Fiji later this year. Building on the extensive development programmes from past years, the 420 Class has developed a package of clinics, support programmes, knowledge toolkits, training academies, have-a-go sessions and promotional activities for 2019. Reflecting the worldwide spread of the 420 Class, our programmes reach out to every continent, with the aim of accelerating knowledge for newcomers and continuing to develop skills and expertise amongst established 420 sailing nations. Click here to find out more. Find out more about our partnership with the 420 Sailing Academy in Vilamoura, Portugal offering you a proven training venue and special rates to use the facilities, boat charter and more. In the meantime, check out our 420 TO THE MAX video, introducing a range of specific techniques and demonstration of how to master them in different wind and sea conditions. Available in English, French, Spanish, German and Japanese, 420 TO THE MAX has racked up in excess of 360,000 views on YouTube alone. Don't miss our 420 EXERCISE E-BOOK which showcases world class training techniques and strategies on Performance Improvement for Coaches and Sailors. The online e-book introduces a selection of carefully chosen exercises, with accompanying video and commentary, to provide a step by step path towards skills improvement.